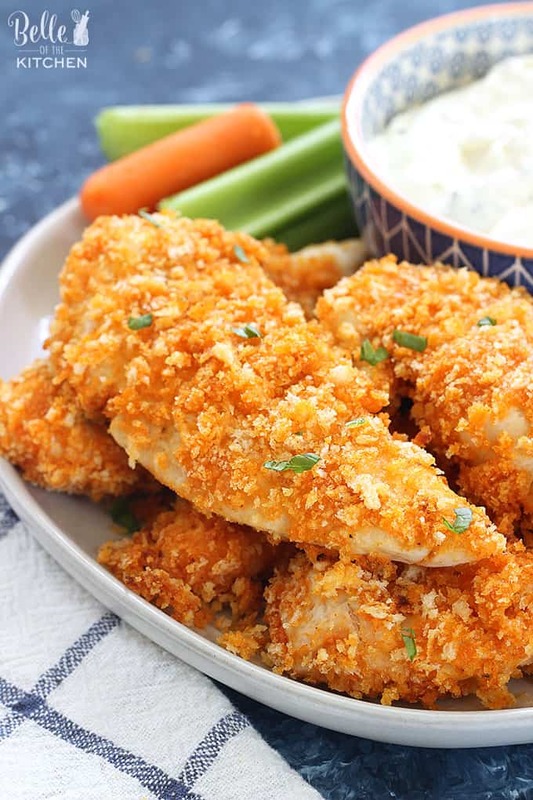 These Baked Buffalo Chicken Fingers are perfect for an easy, tasty dinner, or an appetizer for a crowd. They’re quick, crispy, and taste delicious dipped into bleu cheese with chopped celery and carrots on the side! Ease has been the name of the game here at my house lately when it comes to dinner time. With the soaring temperatures here in Texas and the general busy-ness of having the kids home all day, I’m wiped out when dinner time rolls around. In an effort to keep things simple and to minimize complaints at the dinner table, I’ve been making a lot of food that my kids really like here in the summer months, and these baked buffalo chicken fingers have joined the ranks as one that they happily devour. These are great for dinner served with chopped celery and carrots, and a big bowl of blue cheese or ranch to dip them into. 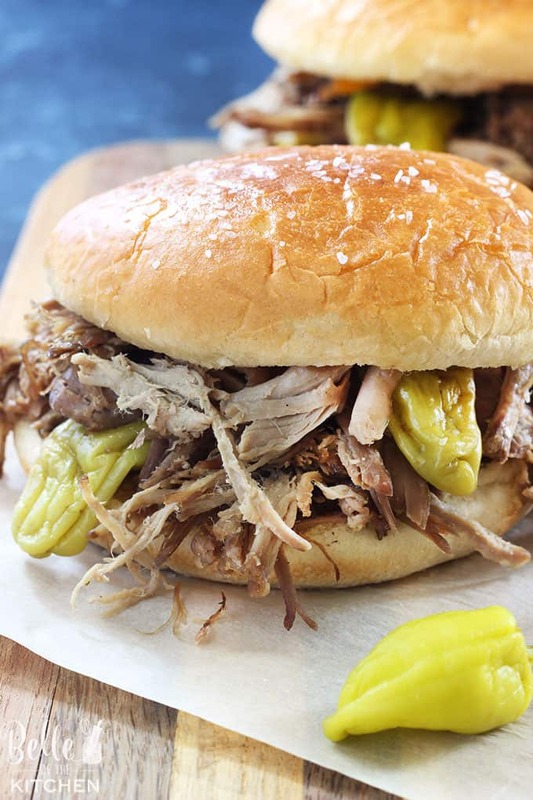 They would also be amazing here in a couple of weeks when football season starts back up and you’re in need of delicious tailgate food. After I bake these, I drizzle them with a little more of the buffalo sauce before serving to really seal in the buffalo flavor. My kids aren’t big fans of spicy food though, so I usually omit that step for the ones that I plan to serve to them. I don’t find these to be very spicy without the sauce added on at the end, so leaving it off is an option if you’d like to minimize the spice level in your buffalo chicken fingers. But if you don’t mind a little kick, the sauce at the end really gives it good flavor! 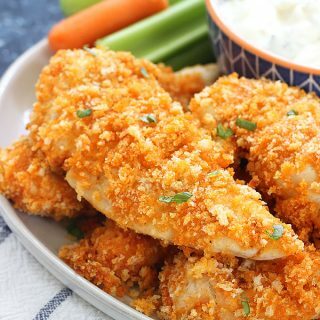 These Baked Buffalo Chicken Fingers are perfect for an easy, tasty dinner, or an appetizer for a crowd. They're quick, crispy, and taste delicious dipped into bleu cheese with chopped celery and carrots on the side! Preheat oven to 400 degrees. Line a large cookie sheet with aluminum foil. Place a raised wire rack (like a cookie cooling rack) on top of the cookie sheet and spray with cooking spray. The rack will allow your chicken fingers to cook without getting mushy, and the spray will keep them from sticking to the rack! Melt butter in a bowl in the microwave, then combine with the buffalo wing sauce and mix well. Remove 2 Tablespoons of the sauce and set aside to reserve for topping the chicken fingers later. Place the panko breadcrumbs in a shallow bowl. In another separate shallow bowl, stir together the flour, garlic salt, paprika, and pepper to taste. Dredge the chicken tenderloins in the flour, then dip into the buffalo sauce mixture. Next dip into the panko breadcrumbs and coat well, pressing the panko into the chicken. Place each tenderloin on to the prepared wire rack. Spray the tops of the chicken with oil or cooking spray, then bake in the preheated oven for 8-10 minutes. Flip the chicken fingers and bake for an additional 8-10 minutes until golden and cooked through. Remove from the oven, and drizzle a small amount of the reserved buffalo sauce over the tops of each chicken finger, about 1 teaspoon each. 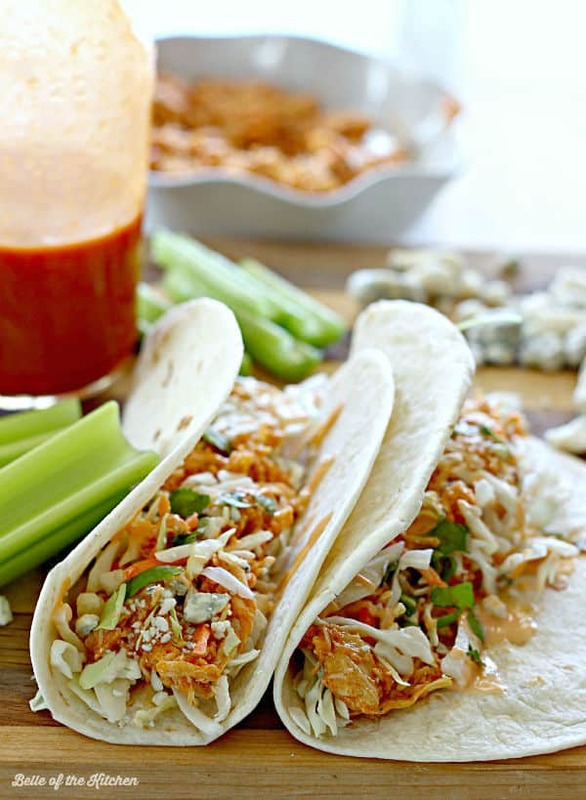 Serve with bleu cheese dip, celery, and carrots. Enjoy! Love the texture on these tenders! They look fantastic. These Chicken Fingers look so crisp and full of flavor! I love that they are baked! This couldn’t survive in my house! Haha. This looks like a dish I could have on repeat at my house. My kids love all things buffalo and I love that it’s easy! These baked buffalo chicken fingers will be perfect when I’m craving wings. These are such a healthier version of fried chicken wings. These look absolutely delicious! So flavourful and something the whole family will enjoy. Oooo these sound delicious! This would be a really easy dinner, and then just pair it with some sides. These look like so great game day food. A healthier option too! 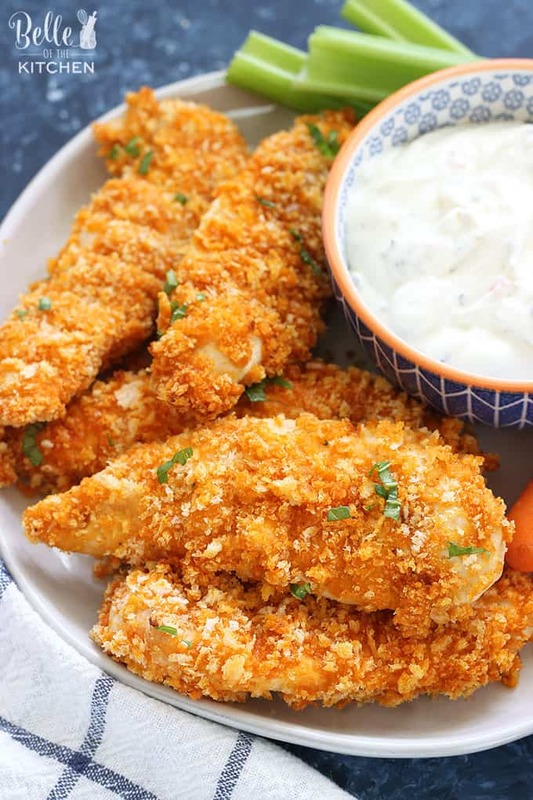 wow just when I thought I have had the best chicken fingers I run across this delicious looking recipe and cant wait to try it maybe dinner tonight! These chicken fingers look so crispy and delicious! Such a great treat for kids! I will not be waiting for “Game Day” to try these out! Yum!